“Last year Juarez had 1,200 murders, El Paso, right next door, a few feet away, had 23 murders,” Trump said. The homicide rate in the Mexican city of nearly 1.5 million has long been much higher than El Paso’s. But that numbers nearly doubled from 2017 to 2018. Last month, eight police officers were ambushed and wounded by gunmen. The U.S. Department of State has asked people to reconsider travel to Juarez due to violent crime and gang activity. ‘Contrary to the president’s claims, though, that violence is unlikely to spill over the border. But El Pasoans are far from unaffected by what’s happening. Every day, thousands walk down El Paso Street in downtown El Paso. The busy street, near the Paso Del Norte bridge, is filled with commuters and shoppers. They chat in a mix of English and Spanish, passing stores selling everything from shoes to cell phones. Everth Chavez has run a small snack stand on El Paso Street for two years. Churros, corn and sodas are bestsellers. Chavez says he’s from Chihuahua City in Mexico, about four hours south. He’s lived here for the past 30 years. “El Paso is one of the safest cities in the country. I don’t know about the world, but in the country,” Chavez says. But that changes several hundred feet from his stand – when he crosses into Juarez. “It’s safe but not too safe. You must be careful,” Chavez says. Chavez is right. El Paso has one of the lowest murder rates in the country. Next door, Juarez is one of the most dangerous cities in the world – for several reasons. Eric Olson is a global fellow at the Wilson Center’s Mexico Institute. Olson says escalating conflict between drug cartels is partly to blame for the uptick in violence. And, he says, Juarez has a lot of youth gangs. They can get involved in crimes like extortion and kidnapping to generate income. “And that actually tends to be more violent than other conflicts between other large cartels,” Olson says. Even though the bloody conflicts don’t cross into El Paso, it still matters. Fernando Garcia is with El Paso’s Border Network for Human Rights. “People in El Paso is very concerned because their relation with Juarez is not only because we have the same border. Families are on both sides of the border,” Garcia says. For many, Garcia says this sweep of violence brings back bad memories from the height of the drug war, ten years ago. Back then, in 2010, there were more than 3,000 murders in Juarez. Tens of thousands fled to El Paso. And now? The crime wave on the Mexican side also has potential economic impacts on the U.S. side. Jon Barela is the CEO of the Borderplex Alliance, an economic development nonprofit. “What is a limiter is the misperception that El Paso and the U.S. side of the border is a violent and lawless frontier. That misperception, unfortunately, continues to be the case,” Barela says. 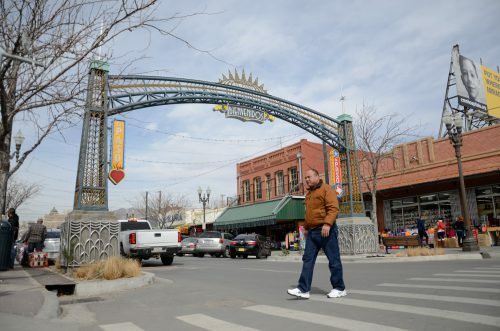 Barela says he often has to correct this misperception for those who many think twice before, say, having a conference in El Paso, or moving a business to the city. At Everth Chavez’s snack stand on El Paso Street, he tells me his business is slowing down. “It’s no good. Not like in the past,” Chavez says. Chavez blames the gas shortage in Mexico, which is fueled in part by criminal gangs. Mexican president Andrés Manuel López Obrador, or AMLO, launched ambitious plans to address this along with other violent crime, which is at a record high in Mexico. “We have hope for the new president that everything is going to be better so this is why I think it’s going to change,” Chavez says. Though Eric Olson of the Wilson Institute says he’s skeptical of AMLO’s big plans. “The problem is that in the past they’ve been very sporadic – they happen momentarily and then they die off and the problem comes back so it’s one of sustainability,” Olson says. Everth Chavez and his fellow El Pasoans will be keeping an eye on the leftist leader. And an even closer eye what’s happening just across the border. This entry was posted in KRTS News and tagged El Paso, Juarez. Bookmark the permalink.